Online slots based on board games always offer something a little different and IGT, via Wagerworks, have a range of games based on Monopoly, the enduringly popular classic allowing players to bankrupt each other by building a property empire. Mega Jackpots is the only one of the series to feature a progressive jackpot so it’s well worth checking out. Mega Jackpots Monopoly has some similarities to the other games but this five reel slot has just nine paylines; Mr. Monopoly himself returns to help you on your way and the symbols are the usual range of properties, piles of cash and fruit. 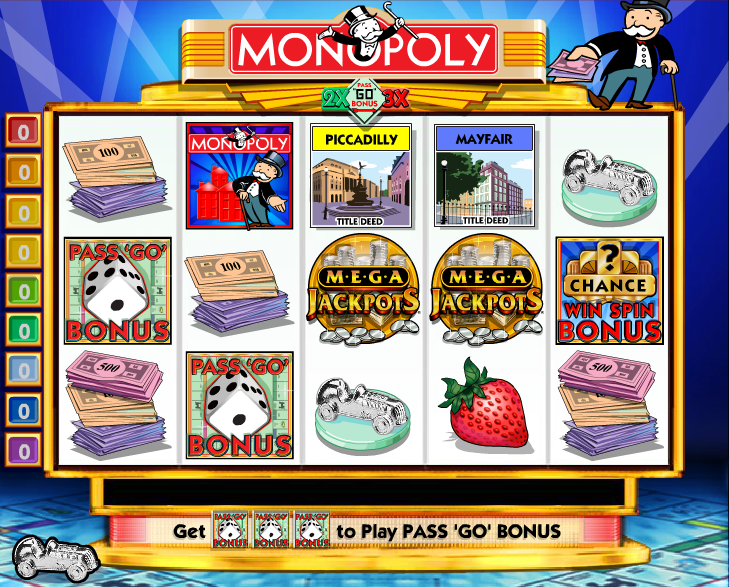 The Mega Jackpots logo is wild and there are two additional bonus symbols which trigger the two bonus features – the Chance Win Spin card and the Pass Go Bonus. There’s a hefty jackpot available here and you can see the ever-increasing total above the reels; to win the jackpot you must be wagering the maximum bet of 5 credits per line and then all you need to do is land five of the Mega Jackpot symbols on the centre payline. Then you can switch off the computer and go and buy a house. Three of the Pass Go symbols on an active payline will kick this game off and initially you need to click one of the winning symbols to reveal the number of dice rolls you’ll receive. You’ll now play some Monopoly, travelling around the board collecting various bonuses and earning increased multipliers each time you land on Go. Obviously the more rolls you receive, the more money you’re likely to win. You need to be playing with all nine paylines to give yourself a chance of triggering this bonus; three of the Chance scatter symbols will activate it and then you need to click on one of those symbols to reveal the number of ‘Win Spins’. Each Win Spin will allow you to keep spinning the reels until you win a a prize and if you’re betting with the maximum bet you can win the progressive jackpot here. The 7th non-winning spin will award you a consolation 10x you total bet. Well, you’re playing a progressive slot and you want to win the big money – make sure you’re betting with the maximum paylines and bet amounts to give yourself a chance. All the IGT Monopoly slots are good fun and this adds to the range while also chucking in a progressive jackpot for good measure. The graphics are true to the board game and there’s lots of other bonus features to retain your interest.